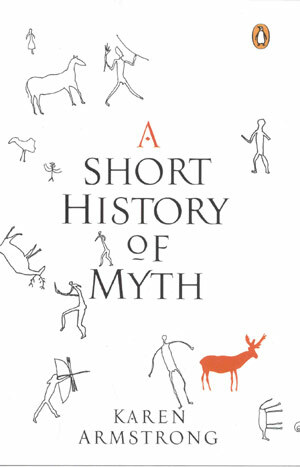 Armstrong emphasises that mythology is not an early attempt at history and that myths do not claim to be objective truths. But their purpose has been widely misunderstood in modern times, where the tendency is to scoff as mythology as being unscientific and opposed to the Age of Reason. In the conflict between logos (reason) and mythos, the importance of the latter was undermined – to the extent that defenders of myths were forced into the ludicrous position of evolving “proofs” for the existence of Allah or the “literal truth” of everything stated in the Bible. In a sense, then, myths continue to be written all around us. And so it’s fitting that for its Myth series, Canongate has called on the services of leading novelists like Margaret Atwood, Jeanette Winterson, A S Byatt and Donna Tartt. The Penelopiad, Atwood’s retelling of The Odyssey from the perspective of Odysseus’s wife Penelope, and Weight, Winterson’s account of the meeting between Atlas and Hercules, are out in paperback now. Posts on those books to follow soon. P.S. I’m not sure how Armstrong can be so certain about the true intentions of mythmakers and storytellers in the ancient world, or about their attitudes to their Gods, but the idea of mythology being separate from religion (as we know it today) is an appealing one. To take a simplistic example, I always think of the Mahabharata as an incredibly rich, complex human drama – an empathetic record of different lives and conflicting motivations – rather than as a story rooted in divinity. Krishna is most interesting not when he is seen an incarnation of Vishnu, fully aware of his celestial purpose, but when he is an ordinary man trying to balance the larger picture with his own human concerns (the respect and affection he feels for some of the people fighting on the Kaurava side). In this case, the supernatural element of the story (the association of Krishna with a remote God) can be seen as a metaphor for human beings trying to overcome their baser sides and reaching for godliness. Gorblimey. All these days I thought this was obvious. I mean, a god who works his wicked will in a shower of gold? A god who lifts a mountain on a single finger? Allegory, parable, the presentation of popular perceptions of another time. Except that the Flood is common to all mythologies and is therefore taken to have historic basis. And Atlantis ...? I was a little surprised to see the author's description of literature as myth-making tool for modern age. I thought literature's role was to enlighten, to make us see beyond myths. I am not an expert on Eliot but calling him a myth-maker just because he used some ancient myths as metaphors is surely wrong. And Orwell and Conrad were nothing but myth-busters, those of politics and modern age. Modern literature, perhaps even more than Science, has been responsible for freeing us from a life protected by myths. This is a very good book which explores similar themes. Hmm.. Will pick up Armstrong's book, since I've read her other works. But the best books (and documenatries) I've read on this subject are the ones by the late Joseph Campbell. A true master. With all due respect, Alok, I think you miss Armstrong's entire point. John Kennedy once said that "the great enemy of truth is very often not the lie . . . but the myth." What is myth except a certain kind of storytelling, a certain kind of explaining not suitable to science? How is that different from the role of literature, modern or otherwise? JAP: I christian thee Already Enlightened. And then there's geo-mythology: a study of story or folk-lore to understand how they might have described natural phenomena without attaching dates and maps and diagrams. Recent interest because of tsumanis. Margaret Atwood doesn't do it so much, but Winterson's always mythologised her stories a bit--esp Sappho, for obvious reasons. There's also Marguerite Youcenaur's Fires...so I'm wondering why the series? good one. hmm...perhaps that explains 'one night @ the call center' and why the book is working despite a incredulus plot. agree? The works of Joseph Campbell are worth mentioning in this regard. Campbell built on some of Jung's ideas about archetypes and wrote about the universal quality of myths. Studying mythologies of various cultures including several American Indian mythologies, he examines myths of heroic achievement, myths of the coming of age of youth etc. and tells them in a timelessly, relevant and contextual way in books such as "Myths to Live By". Of course, it is a well known fact that the Star Wars stories was influenced by Joseph Campbell's writings just as he himself took interest in the movies. There was also a wonderful series of conversations with Bill Moyers that are now available in DVD form as well as a coffee table book called The Power of Myth. Classics endured... & so might we.